Are your pets or kids wearing out a certain spot of sod? 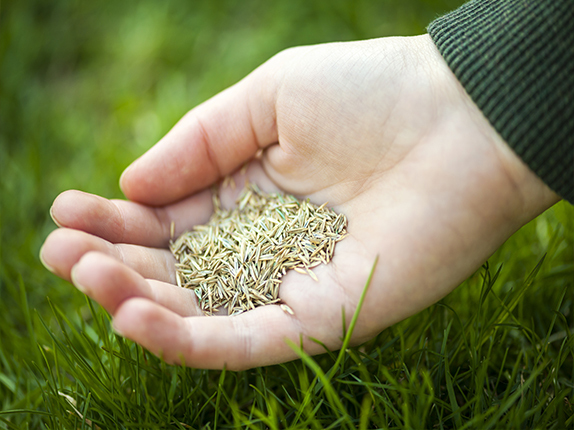 Over-seeding will not only thicken up your grass, it will also improve your lawn’s drought-tolerance and give it a darker green color. Mow your yard to one inch tall before over-seeding in the spring. Vigorously rake your lawn to remove thatch and break up surface. When over-seeding with BioBlue® use one lb. per 1,000 square feet. For BioTurf® seed use one lb. per 700 square feet. See our new sod watering section for help establishing seed. And never allow over-seeded areas to dry out. Prepare your soil with help from our soil preparation section. Measure the square footage of the entire area you wish to seed (length x width = square footage). Spread BioGrass Suståne 4-6-4 root-starting fertilizer over the entire area (one 50 lb. bag per 2,000 square feet). Select the proper seeding ratio for the type of seed you are using. BioBlue® seed = 1lb. per 300 square feet. BioTurf® seed = 1lb. per 100 square feet. Lightly rake soil in one direction before spreading seed. Once seed has contact with soil, lightly rake soil in the opposite direction. This allows seed to be properly covered by soil. Initial watering should allow soil to become completely saturated. Do not flood the area. See our new sod watering section for more tips. Maintain continuous moisture in seeded areas for up to one month. Seed should never be allowed to dry out however, too much water can be just as disastrous as too little. Once seeds sprout, water can be decreased, but daily waterings will still be needed. An average lawn takes six to nine months for complete establishment. For best results, seed only between the warmer months of April and September.